How do I get a tuition schedule to automatically apply to a new student? This tutorial assumes that you've already set up your tuition schedules, admissions applications, and academic programs! To complete all the steps here, you must have the Financial Admin, Academic Admin, and Admissions Admin user roles—or help from someone who does. Let's say that you want those who fill in your General Application to enroll in the Undergraduate program. In turn, you want those in the Undergraduate program to be charged according to the Undergrad tuition schedule. First, you want to make sure your application links accepted students to the right program. In Admissions > Settings > Application Forms, select an application. In the right column under Settings, click Programs. 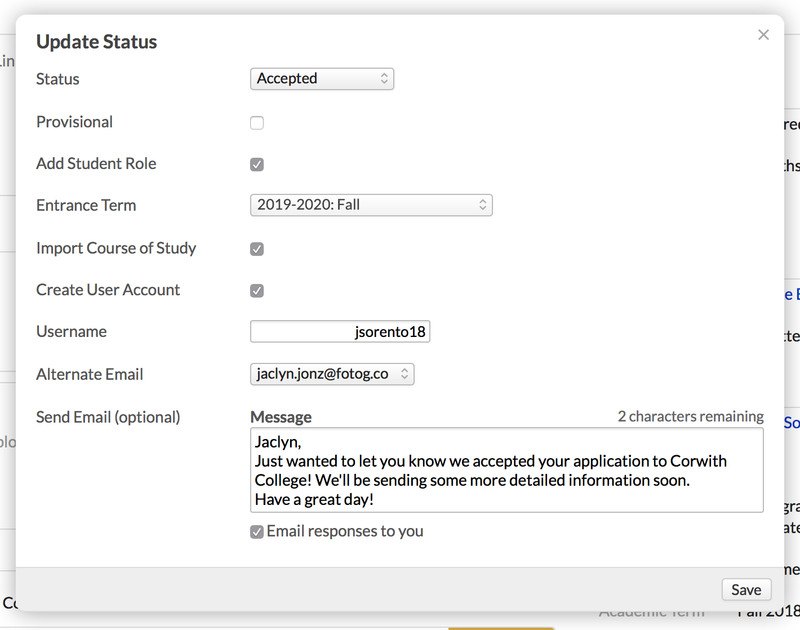 Select the academic program to which you want to apply this application, and click Add. You can add multiple programs if you so desire. Next, you need to associate the academic program with a tuition schedule. Go to Academics > Programs and select the program you just added to the application. In the Information panel in the right column, click edit. Check off the Default Tuition Schedules you wish to attach to students enrolled in this academic program. A lead starts and completes the Undergraduate Application and you decide to accept her. When you accept the application, you A) import her course of study and B) give her the Student role. She is now a student; what's more, you've imported her course of study, which includes the Undergraduate program inherited from the application. Since the student is in the Undergraduate program, her Financial > Dashboard shows that her Default Tuition Schedule is set to Undergrad. And once she registers for courses, the Undergrad Tuition Schedule will also display on her Financial > By Term view (together with the tuition schedule's Refund Policy). How do I charge students for tuition and fees?